"Do you have an ESTA?" asks the Air New Zealand lady behind the check-in counter. "An ESTA. Or maybe some kind of travel Visa?" "I... I didn't think you needed anything like that." I can't recall the rest of the conversation; just that, in my mind, I was holy-shitting myself that I had forgotten some very vital documentation or process that I needed to get into the US. I didn't need a travel visa the last time I went to the US. When was that? Oh... 1999. I wave my dad over, who was waiting to the side while I was hoping to check in, and have him listen to all the information the Air NZ lady was telling me. I was doing a good job of keeping my emotions in check, whereas my dad was quietly swearing to nobody in particular and running his palm over his face as the implications of this 'missing ESTA' start to hit him. The lady gives me a website to start the ESTA process, and I thank her for it. Meanwhile, my dad had rung up my mum to tell her about the sudden and massive roadblock that has positioned itself between myself and my flight. I don't know what he intended to achieve by doing that; all the call managed to do was make both of my parents worry on my behalf - I could hear my mum on the other end of the call also swearing and imagined her running her palm over her face. Great, I think, now I've got 2 distraught parents to worry about, on top of not having a travel visa. And thus began my holiday to San Francisco and the SpringOne 2GX conference, at which I would be speaking at, in Santa Clara. I guess any veteran travellers reading this right now would be balking at my stupidity at having forgotten to get a travel Visa for the United States. In my defense, I travel very little - the last time I left the country was for a meager 3 days to Melbourne, Australia, which is so close to New Zealand and with whom we have such a great country-to-country relationship that it barely counts as international travel. So my dad and I sat down at one of the tables set aside for any of the customers of the 2 airport-priced (read: unnecessarily expensive) restaurants either side of us, and decided what to do next. I already had a plan: it was a Monday, so my travel agent, through whom I planned and arranged most of this trip, would be at work. I would give her a call, and between the 2 of us we should be able to figure something out. "Hi," I say, in reply to her greeting, "Emanuel here. So I was about to fly out, but I seem to be missing an 'ESTA'?. Any idea what that might be?" "Oh, wasn't there a note attached to your flight times to get that sorted out?" she asks. "No, or I don't think there was. I'll look through my e-mails again. Is there anything you might be able to do to help me out?" "Sure, I can get on it right away. When does your flight leave?" "Oh good, that's plenty of time. Leave it with me, and I'll get back to you in about 15 minutes." The first thing I did when that call ended was to check my e-mails to make sure that there was no hidden note that I missed. It didn't take long for me to not find that e-mail, because my flight times were never sent to me - I suddenly remembered that I went to her office that day to pay for the flights and pick those up. So there was no note, but there was no e-mail either. I don't think either of us could really have taken the blame then. My dad recognizes an old workmate of his and goes to speak to him. I can tell by the way he's gesturing and the other guy is looking at me that he's recounting our little travel visa troubles to his workmate. Still, I fail to see how this would achieve anything, but I guess a little sympathy or shared plight helps to ease the trouble on his mind. Well, whatever works for him I guess. Unfortunately for my mum she can't employ that kind of therapy as she's home alone, and so is possibly running around the house like a headless chicken. I call the travel agent again in 20 minutes, leaving a message on her answering machine. 5 minutes later she returns my call, letting me know that it's all done and sorted. There was a little cost associated with it, but I was prepared to bear a much more significant price to see it through. I thanked her far too many times for her help, ended the call, told my dad it was all sorted, and proceeded to check-in to my flight. For real this time. Lesson learned: if you're travelling to the US, you need a travel visa / ESTA. Oh God, is that the CEO? I wonder, sitting comfortably in one of the gates of Auckland International Airport. I'm on this vacation to get away from work, and here is the head of my company, and I haven't even left yet. I started work at Xero only a month ago, so there's slim chance he'd recognize me. Regardless, I position my iPad between him and my face, just in-case. Wait, is he boarding? They only called Business Class passengers up fir... ah. Sunnovabitch. The jealousy is only token at that point, but doesn't really make an impact until my good-old Economy Class row gets called up and I find myself in the classic tiny seat that I remember from the last time I flew overseas all those years ago. It was a lot worse for the guy sitting next to me, Justin, a 6-foot-something basketball player who had just finished his season in Australia and was heading back home to San Francisco. He was slouching just a little bit in his chair, but by doing so his knees were already touching the seat right in front of him. We thought for a moment that he could spread out to the window seat if nobody sat down there, but of course the window seat is always taken. Cue our window seat buddy, Nicole, a petite Australian cheerleader who was the last of us to arrive, so Justin and I got out of our seats to make way for her, and it wouldn't be the last time we'd have to do that this flight either. It didn't take long for all 3 of us to discover that she had the smallest bladder out of all of us, having to go to the toilet at least 5 times that flight, including when I was asleep and Justin had to wake me so she could get through. That time, when she had just started walking down the aisle towards the toilets in the dark, Justin and I looked at each other, half-smiling and half-laughing at our situation, but only half because, just like everyone else on this flight, we were tired and hoping to catch some kind of sleep before we got to our destination. "I don't know how you guys can do it." she said to us after she returned and we had all sat back down. "I don't think either of you have had to go yet!" True enough, I felt no urge to go to the toilet on this 9-and-a-half-hour flight. Then again, she was the only one who said 'yes' to wine for drinks - it was just juice or water for us guys. It didn't look like any of us were getting to sleep, so we talked. Turns out Nicole was a cheerleader for an basketball team, so she and Justin knew a lot of the same people between them. She was going to San Francisco to meet up with some friends and, from there, start a month-long trip across the United States with friends and distant family. She also got food before either of us since she had to order gluten-free food. We talked at length about food after that: Justin trying to think of places she could eat in San Francisco, and me talking about my recent forays into gluten-free baking. Justin was just looking forward to going home. He told us stories of the things he and his family would do at family gatherings, the kinds of food his mother would cook - the things one talks about when the topic is home and home is being missed. And me, well I told them what I had been telling everyone else in the months leading up to today: that I was speaking at a conference in Silicon Valley and was spending the week before the conference in San Francisco for a holiday. We each eventually managed to find sleep to wake up to airplane food breakfast and a view of California before we touched-down. All I could remember of the approach to America the last time I was here was that the city of Los Angeles was covered in a haze of pollution, visible from the air as a thin yet eternal fog, and visible from the ground as a layer of grey over the horizon. San Francisco didn't seem to have any of that as we flew alongside the coast and looked out our small porthole of a window. A quiet overtook us as we walked off the plane and into San Francisco International; relief at having made it to our destination. I was thankful for my plane buddies as they really helped make that long flight time just pass by, but the moment that thought crossed my mind, Justin said his goodbyes as Nicole and I wondered why he was saying goodbye so soon. Then we looked ahead of us and saw why. We were being split into 2 groups: US Citizens, non-US Citizens. Ah, customs. I remember. My mind recalls the barriers of entry to a country and the gatekeepers that keep those barriers running. Justin took the shorter line into the US, whereas Nicole and I waited in a line that reminded me of those preceeding the most popular Disneyland rides. 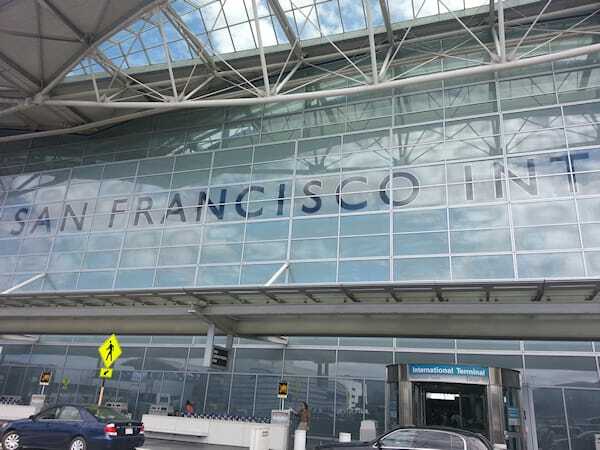 Once passed customs and into the open air of San Francisco, Nicole and I said our goodbyes as she made her way to the shuttle that she had booked a seat on beforehand. As for me, this was the beginning of the part of my vacation where there were no plans. From here on out, I was playing it by ear, and hoping I didn't get stabbed in the process. My first solo vacation, I thought, and smiled.